Transfer data quickly and reliably with the 15' black TetherPro USB 3.0 Male Type-A to USB 3.0 Micro-B Cable from Tether Tools. 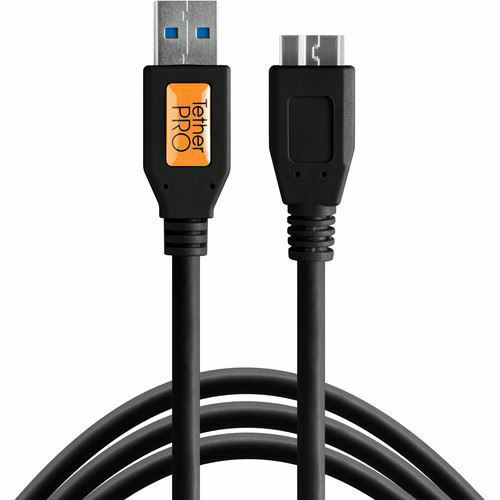 This cable comes with a standard USB Type-A connection that connects to desktops, notebooks, and tablets, and a USB 3.0 micro-B interface is on board to power and transfer data for portable storage drives. The cable is fully shielded to filter out signal noise and reduce transmission errors. USB 3.0 technology provides transfer speeds of up to 5 Gbps when used with compatible devices. Box Dimensions (LxWxH) 5.25 x 5.25 x 1.2"